[159 Pages Report] on Solar Photovoltaic Glass Market is projected to grow from USD 4.38 Billion in 2017 to USD 18.48 Billion by 2022, at a CAGR of 33.4% from 2017 to 2022. For company profiles in the report, 2016 has been considered as the base year. In certain cases, wherein information is unavailable for the base year, the years prior to it have been considered. The research methodology used to estimate and forecast the size of the solar PV glass market began with capturing of data on key vendor revenues through secondary sources, such as Hoovers, Bloomberg, Chemical Weekly, Factiva, and various other government and private websites. The vendor offerings were taken into consideration to determine the market segmentation. After arriving at the overall market size, the total market was split into several segments and subsegments, which were later verified through primary research by conducting extensive interviews with key personnel, such as chief executive officers (CEOs), vice presidents, directors, and executives of the leading market players. Data triangulation and market breakdown procedures were employed to complete the overall market engineering process and arrive at the exact statistics for all segments and subsegments of the market. The breakdown of profiles of primaries is depicted in the figure below. The solar PV glass market has a diversified ecosystem of upstream players, including raw material suppliers, along with downstream stakeholders, vendors, end users, and government organizations. Companies operating in the solar PV glass market include AGC Solar (Japan), Nippon Sheet Glass Co., Ltd. (Japan), Taiwan Glass Ind. Corp. (Taiwan), Xinyi Solar Holdings Ltd. (China), Sisecam Flat Glass (Turkey), Guardian Glass (Thailand), Saint-Gobain Solar (France), Borosil Glass Works Ltd. (India), Henan Huamei Cinda Industrial Co., Ltd. (China), Guangfeng Solar Glass (Hong Kong) Co., Ltd. (China), Flat Glass Co., Ltd. (China), Interfloat Corporation (Germany), Guangdong Golden Glass Technologies (China), Hecker Glastechnik GmbH & Co. KG (Germany), F solar GmbH (Germany), Emmvee Toughened Glass Private Limited (India), and Euroglas (Germany). Scope of the Report: This research report categorizes the solar PV glass market based on application, type, end user, and region. The solar photovoltaic (PV) glass market is projected to grow from USD 4.38 Billion in 2017 to USD 18.48 Billion by 2022, at a CAGR of 33.4% from 2017 to 2022. Surging demand for solar energy in emerging economies and preference for solar energy in the residential applications are the key factors contributing to the growth of the solar PV glass market across the globe. Among applications, the utility segment led the solar PV glass market in 2016. This segment is also projected to grow at the highest CAGR during the forecast period of 2017 to 2022. The growth of this segment of the market can be attributed to increasing installation of utility-scale solar power plants across the globe that have been generating reliable and clean energy with stable fuel prices for over two decades. Although the utility-scale solar energy represents a small percentage of the global power generation at present, the installations of solar power plants are growing rapidly across the globe for both, utility as well as distributed power generation applications. Increasing installations of utility-scale solar power plants and rising government investments for harnessing solar energy are expected to drive the growth of the utility application segment of the Asia-Pacific solar PV glass market between 2017 and 2022. On the basis of the type, the solar PV glass market has been categorized into AR coated, tempered, TCO coated, and others. The AR coated type segment led the solar PV glass market in 2016. This segment of the market is projected to grow at the highest CAGR during the forecast period. The tempered type segment of the solar PV glass market is projected to grow at the second-highest CAGR during the forecast period of 2017 to 2022. The Asia-Pacific region is estimated to be the largest market for solar PV glass in 2017. 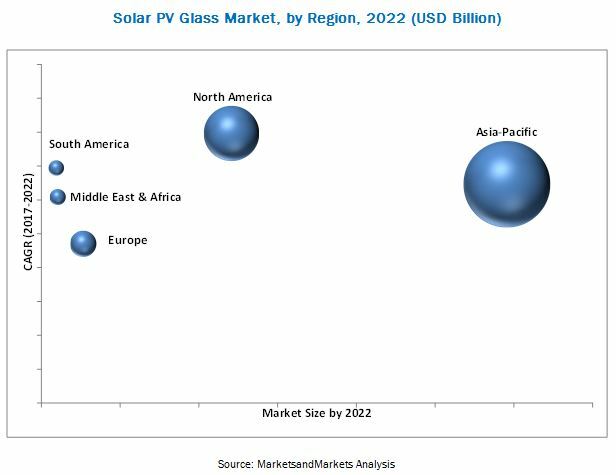 The growth of the Asia-Pacific solar PV glass market can be attributed to the rising demand for solar energy in the region and increasing initiatives undertaken by governments of various countries to reduce emissions of greenhouse gases. In addition, the introduction of renewable sources of energy for electricity generation is also expected to contribute to the growth of the Asia-Pacific solar PV glass market between 2017 and 2022. China, India, Japan, and South Korea are the major countries contributing to the growth of the Asia-Pacific solar PV glass market. The factors inhibiting the growth of the solar PV glass market are the high costs involved in the installation, storage, and purchase of power conversion devices, increasing prices of raw materials, and stringent implementation of various regulations on carbon dioxide emissions. Key players operating in the solar PV glass market include AGC Solar (Japan), Nippon Sheet Glass Co., Ltd. (Japan), Taiwan Glass Ind. Corp. (Taiwan), Xinyi Solar Holdings Ltd. (China), Sisecam Flat Glass (Turkey), Guardian Glass (Thailand), Saint-Gobain Solar (France), Borosil Glass Works Ltd. (India), Henan Huamei Cinda Industrial Co., Ltd. (China), Guangfeng Solar Glass (Hong Kong) Co., Ltd. (China), Flat Glass Co., Ltd. (China), Interfloat Corporation (Germany), Guangdong Golden Glass Technologies (China), Hecker Glastechnik GmbH & Co. KG (Germany), F solar GmbH (Germany), Emmvee Toughened Glass Private Limited (India), and Euroglas (Germany). 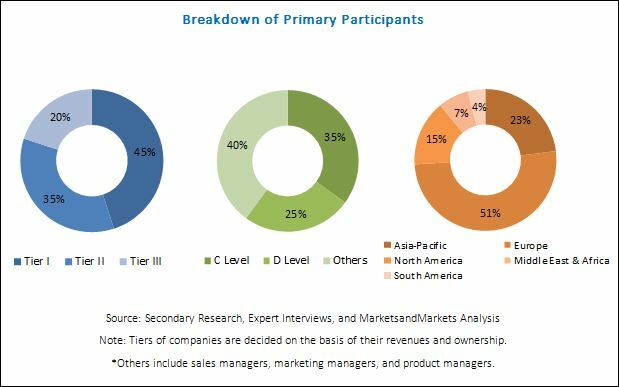 These market players have adopted the strategies of new product launches, mergers & acquisitions, and expansions to meet the growing demand for solar PV glass across the globe and to increase their market shares. 11.2 Nippon Sheet Glass Co. Ltd.
11.3 Taiwan Glass Ind. Corp.
11.4 Flat Glass Co. Ltd.
11.5 Xinyi Solar Holdings Ltd.
11.9 Borosil Glass Works Ltd.
11.12 Guangfeng Solar Glass (Hong Kong) Co., Ltd.
11.15.2 Qingdao Migo Glass Co., Ltd.
11.15.4 Avic Sanxin Co., Ltd.
11.15.7 Shenzhen Topray Solar Co., Ltd.
11.15.8 Changzhou Almaden Co., Ltd.
11.15.11 Jin Jing (Group) Co., Ltd.